Lampshades with pom poms – thanks Mum! 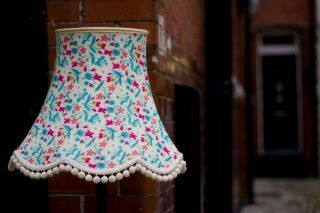 I’ve just booked a place on a traditional lampshade making course at Homemade London, and I’m very excited! My Mum gave me some money for my (big) birthday this year and I’ve been looking for something to spend it on. I love this Liberty Lampshade made by Angela from Cocoon Home who runs the course and I’m hoping it will be something gilhoolie can offer in the future, with pretty fabric and pom poms! Oh! I’d love to do this too! I’m going to put it on my major wish list! It looks gorgeous doesn’t it?! I can’t wait, will let you know how it goes!